SONshine Entertainment is owned and operated by Larry Mahan who has been performing professionally since the late 60's. He started performing in Seattle Washington, and has performed in Alaska, the Caribbean, many states in between as well as Canada and Mexico. 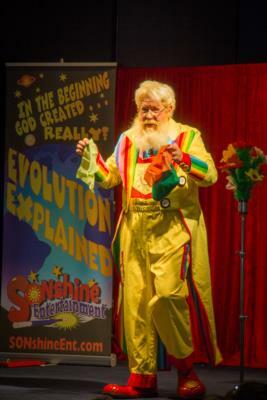 He has lived in Colorado Springs, CO for over 40 years and has performed as Mr. SONshine for most of that time. He has also performed as Houlihan the Animal Man, Walker D. Planke the Pirate, and Dr. Whodathunkit, the Crazy Scientist. for all ages. Mr. SONshine is everything a children's entertainer should be, He's colorful, he's silly, he's funny, he's entertaining, and he is versatile. But Mr. SONshine is better than all of that. Because he does not wear clown makeup he is less intimidating to the really young, and less condescending to the preteen crowd. The illusions he performs and the patter that he speaks are customized to reach a large age range of children. His show is ideal for kids from four to twelve years old, but really he appeals to a much wider age range. His show is filled with humor and crazy antics. Live animals, puppets, and magical stories are all part of the SONshine Entertainment experience. In Mr. SONshine's show, you may see a miniature "Lion", a Parrot, Doves, a Rabbit or even a tiny Dog. Puppets may show up like a Skunk, a Possum, or Bandit, the mind-reading raccoon. Mr. SONshine performs at churches, birthday parties, retirement and nursing homes, and many other venues. Larry was a Children's Pastor for 14 years. He is past president and vice president of the Socienty of American Magicians Assembly 170 and has been the President of the Rocky Mountain Chapter, Fellowship of Christian Magicians for numerous years. 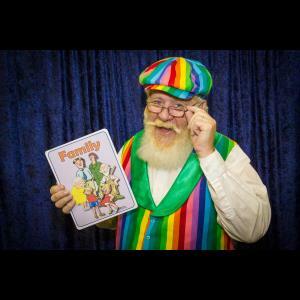 He is an author of several books and publications on performing, magic, balloons, spring animals, and teaching Creation to kids. Larry is a composer of children's songs and also performs as Santa, and even sometimes, as Larry Mahan himself. Please note SONshine Entertainment will also travel to Manitou Springs, U S A F Academy, Cascade, Green Mountain Falls, Fountain, Monument, Peyton, Woodland Park, Palmer Lake, Elbert, Victor, Divide, Cripple Creek, Larkspur, Florissant, Calhan, Penrose, Sedalia, Yoder, Lake George, Franktown, Castle Rock, Canon City, Kiowa, Florence, Elizabeth, Pueblo, Coal Creek, Ramah, Rockvale.